How To Recover Lost Clash of Clans Village : Clash of Clans ever since its release in 2012 from Supercell is one of the most popular and addictive strategy game. What could be the most devastating thing for the player in Clash of Clans? Well ! Yes you are thinking right. It is losing our village which we have created with so much passion, dedication and giving all night and day to it. Even thinking about it will give a serious Clash of Clans Player the chills. But we can recover our lost Clash of Clans village back and this guide is all about that. Now for those who haven’t faced this helpless situation yet here it is why it can happen. Newbies may not be knowing how to link our account to the game for backing up. If you are a beginner and haven’t done the linking yet then it is strongly recommended you should do it. But sometimes we have troubles with our devices, unable to link account in a rooted android mobile or jail broken iOS one, having trouble with accounts and that time we are simply helpless. Windows/Mac PC users get this tutorial to install Clash of Clans for PC, Laptop Windows 10/7/8.1/8/XP/Mac[64 Bit/32 Bit]. Isn’t it awesome playing our favorite clashes on biggers screens?. Yes right ! The method to get our lost Clash of Clans village back is quite simple and it is just a message talk with the developers of the game Supercell. Following are the steps to get your lost village back. Don’t you want to use bluestacks as a primary emulator to play clash of clans don’t worry still we have options to install Clash of Clans for PC Without Bluestacks on Windows 10/7/8/8.1/XP Laptop. Also check: Download vShare on Android and get Premium Apps for free. In Clash of Clans we need to tap on Settings icon and thereafter Help and Support. On the top right there would be a send icon to send message to Support Team. If possible we should attach a screenshot of our village. Now click on submit to send the information to the support team. Time which it will take ; all depends on how much information we have provided. Usually after some days Clash of Clans team will send us an Alphanumeric Code which we need to copy into Settings/Link a Device and Boom ! ! we have successfully recovered our lost village. Do Check : How to Setup WhatsApp Profile Pic Without Cropping. Also Check: Two Clash of Clans[COC] Accounts in One Mobile phone[Android/iOS & Other]. So this is it. But it is highly recommended that we do take all the necessary steps so that we shall never lose our village. 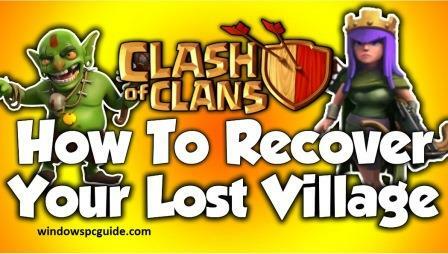 In case still it happens just follow the guide and easily get your lost clash of clans village back. Want to read something really exciting? I bet you do. If you face any difficulty while recovering lost coc village on Android, iOS(iPhone/iPad), Windows Phones, BlackBerry and lot more devices feel free to ask our clash of clan experts. Still are you guy’s struggling to go for higher levels this might help you that is Milking and Farming Strategy of Clash of Clans[COC] Tricks/Tips. Mates after following above tutorial recover or get back Clash of Clans Village attach your screenshots here so that our readers will get some idea about procedure. Thanks 🙂 . i have to coc account but now i forgot my usser name and password. My lost village is townhall 10 and called mehrshad and it’s xp level is about 84. Please give it back to me. A code has been provided by coc to me to get back my village how to use that code? Do you have any idea? how to put this code? Please get me my village, hypnotyzee town hall 8 level 77.